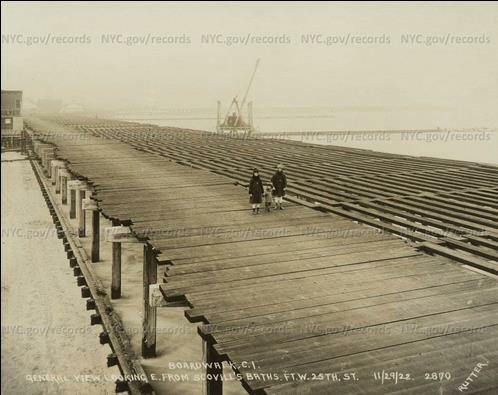 This Sunday, May 15, is the 93rd anniversary of the official opening of Coney Island’s Riegelmann Boardwalk. Last week, Coney poet Michael Schwartz crooned a few lines from “Under the Boardwalk” and recited poetry as part of his testimony before the City Council’s Land Use Committee. He was among about 15 people who took time out from their work day to speak at City Hall in favor of Councilman Mark Treyger’s resolution that the Landmarks Preservation Commission designate the Boardwalk a scenic landmark. The LPC had previously said no, but is now said to be reconsidering. You may want to phone, email or write letters of encouragement to Meenakshi Srinivasan, Commissioner of the Landmarks Preservation Commission. Contact information is here. Use the hashtag #LandmarkTheBoardwalk when you post on social media. Schwartz’s eloquent testimony, printed in full below, begins with an excerpt of his poem, “The Under-Talker,” from a book-in-progress of poems, short stories and monologues set in Coney Island and called The Invisible Exhibitionist and other Attractions. What will happen to us now that they took away under the boardwalk? I heard that pushing the sand right up under the boards like that is what causes them to erode and crack. I wish we could have our down by the sea on a blanket with my baby under the boardwalk back. Did you hear that when they filled it in Homeless John the Under-Talker was buried alive? I could still hear him talk. you can still hear him talk. First they came for under the boardwalk… Then they came for the boardwalk. It started already. Part of the boardwalk’s already been paved over, even though that’s not what the people wanted. And in the middle of the night before it would have been landmarked, they bulldozed our beloved original Thunderbolt. And they came under darkness in the middle of the night and destroyed our beloved West 8th Street bridge to the boardwalk that protected us from traffic, because we didn’t have the power to protect it. 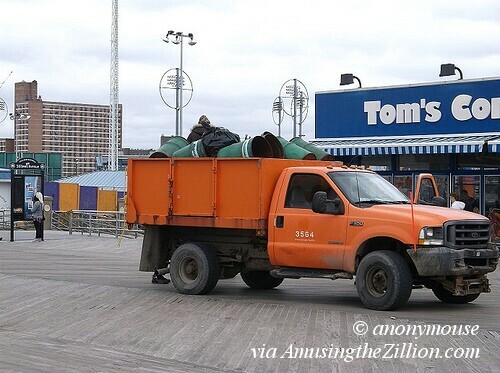 If we don’t have the power to protect our world famous beloved boardwalk that connects neighborhoods, businesses, and people, one day we will wake up and it won’t be there, at least not as we know it. Where’s the boardwalk? Oh my God, it’s a sidewalk. Don’t we have enough sidewalks? The historic beloved boardwalk is one of the last walkways in our world that is an oasis from the concrete that hardens our souls and hammers our joints. Also, concrete will not absorb water or heat the way wood does. In this apocalyptic time of hurricanes and floods, the walkway by the water is wood for practical as well as aesthetic reasons. Coney Island is called the people’s park because it’s different than those other sanitized corporatized parks. 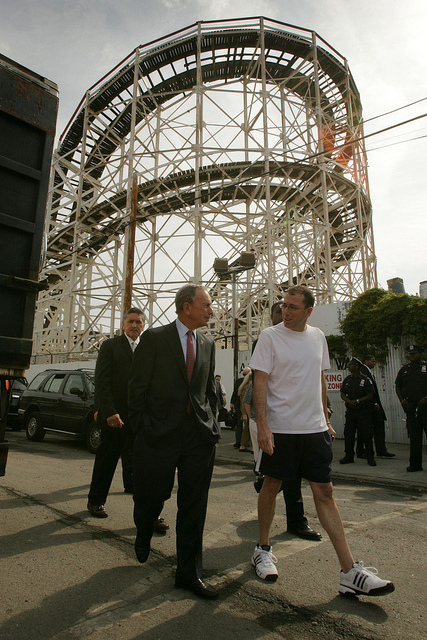 When Coney becomes corporatized, such as when the Republican nominee’s father Fred destroyed Steeplechase, they demolish more than just the people’s parks, they break the people’s hearts. We’ve seen too many New York treasures wiped out by corporate greed, little by little turning the greatest city in the world into just another impersonal unaffordable clone of Anymall, USA. We lost the original Penn Station, the 8th wonder of the world, because it wasn’t landmarked. We saved Grand Central Station because it was landmarked. 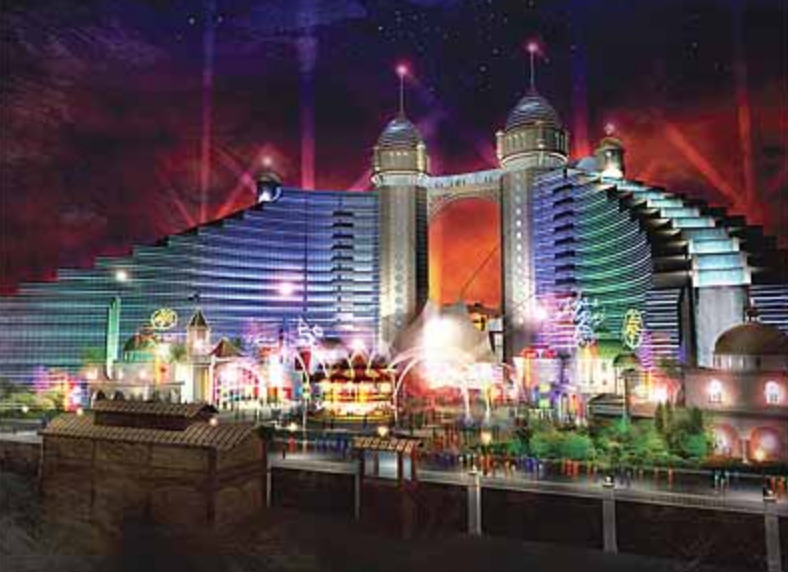 If we don’t landmark the boardwalk, we’ll lose it. We’ll lose ourselves. PYE Properties, the owners of the Surf Avenue lot across the street from the Coney Island Cyclone, have started advertising for vendors for a flea market set to open in May. Like some of the furniture stores and a cafe on the north side of Surf, it’s named after one of Coney’s amusement parks — Luna Park Flea Market. According to their new website, the price for a spot on Friday, Saturday or Sunday is $50, while other days of the week will go for $30. Over the past decade, the vacant lot, which has 140 feet of frontage on Surf and is 90 feet deep, has occasionally been used as a parking lot. For one day in 2011, the lot briefly hosted John Strong’s sideshow until the previous property owners abruptly did an about-face and went back to parking cars. Bumper cars and other amusements were in the building on the site which was torn down in the 1950s. Until the early ’80s the north side of Surf Avenue was home to individually-owned penny arcades and a variety of rides including carousels and even a Jumbo Jet-style coaster. Last year, the Surf Avenue lot at 805-825 Surf Avenue was Brighton Beach-based PYE Properties’ first acquisition in Coney Island. In January, PYE purchased the landmark Shore Theater for $14 million. According to the development company’s website, “PYE Properties is a full-service development company guided by our in-house team of result-driven real estate professionals whose expertise includes acquisition, design, development, construction and property management.” The flea market is a seasonal use for the short term until development gets underway. 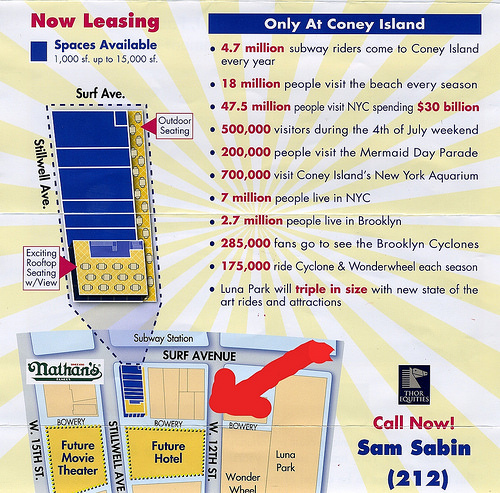 Since the 2009 rezoning of Coney Island, the north side of Surf has seen restaurants such as Grimaldi’s, Applebee’s, and Subway Cafe rapidly replacing furniture stores and vacant lots. Johnny Rockets and IHOP franchises are under construction. Mom & Pops on the north side include Chill party space, Red Doors Bar & Grill, and Piece of Velvet Cupcakes. The flea market did not open on July 4th Weekend and remains closed. Dear friends, if you truly love Coney Island, then get yourself to City Hall on Wednesday, May 4th, to speak up to landmark the Boardwalk. 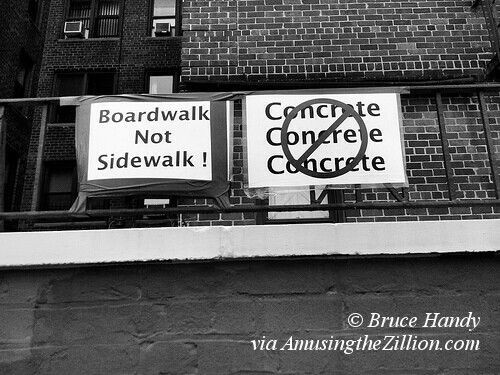 Stay away and we’ll be forever damned to walk the Coney Island Concretewalk. Fail to show up and the patterns of freshly fallen snow on the slatted boards will one day exist only in archival photographs. 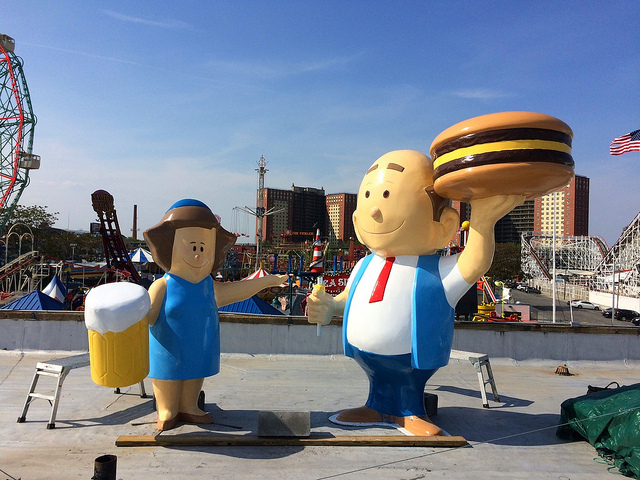 The City Council’s Land Use Committee is meeting at 11 AM to hear testimony on Coney Island Councilman Mark Treyger’s resolution calling for the boardwalk to be designated a scenic landmark. 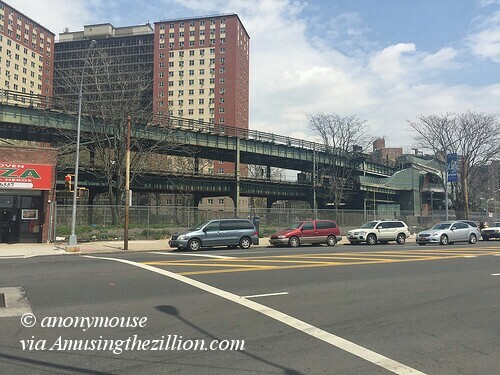 In February, 48 City Council Members, as well as Public Advocate Letitia James, signed on to the resolution, yet the Landmarks Preservation Commission remains silent. If it were not for Treyger’s tireless efforts on behalf of the boardwalk, this issue would have vanished from the public eye. The City’s other scenic landmarks and dates of designation are Morningside Park (2008), Fort Tryon Park (1983) Bryant Park (1974), Central Park (1974), Riverside Park and Riverside Drive (1980), Verdi Square (1975), Eastern Parkway (1978), Grand Army Plaza (1974), Ocean Parkway (1975) and Prospect Park (1975). 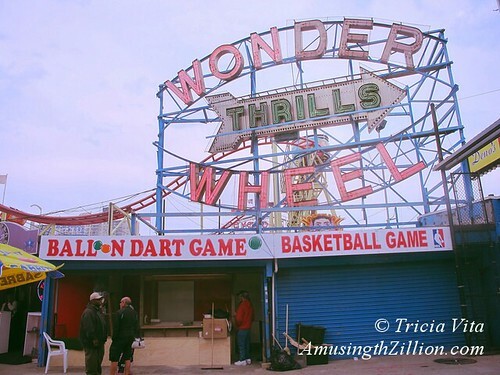 Doesn’t Coney Island’s world-famous boardwalk deserve to be among this illustrious company? May 15 is the 93rd anniversary of the Riegelmann Boardwalk’s official opening. See you tomorrow at City Hall and let’s make it a celebration.